You don't want to use the same old boring template everyone else uses in PowerPoint. 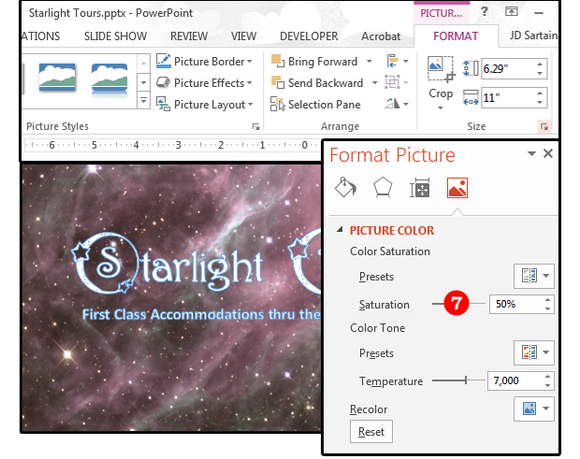 PowerPoint has a great set of special effects, graphics, animations, and template themes. There’s just one problem: Everybody else has the same effects, animations, and template themes that you have. The last thing you want is to look unoriginal. Here’s how to make something unique that will help you stand out from the crowd. Let’s start with an easy one. 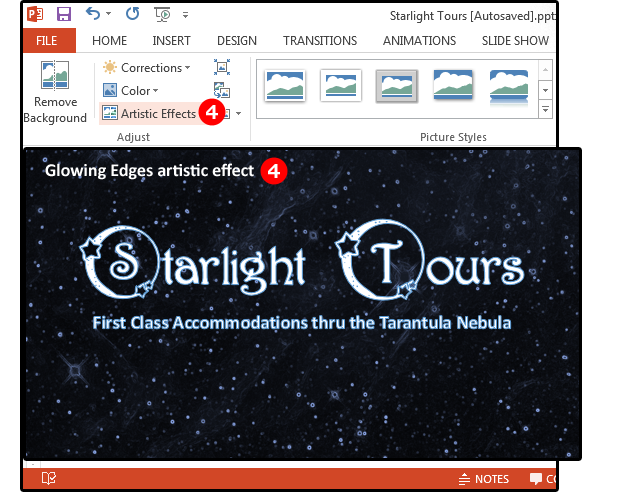 On the main menu, select the template titled Crimson Landscape Design slides. The background on this slide is an image. The easiest way to customize it is to select a different image. 1. From the Design tab, click Format Background. 2. 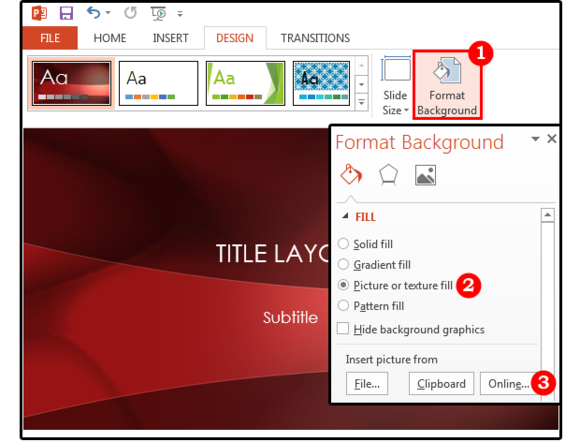 In the Format Background box under Fill, verify that the ‘Picture or texture fill’ button is selected. 3. Under ‘Insert picture from,’ click ‘Online...’. 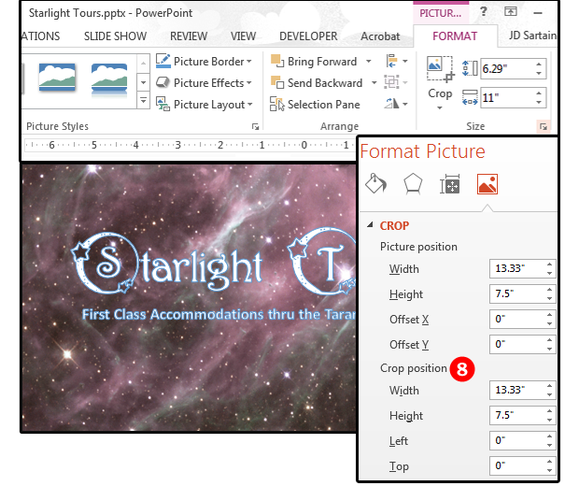 In the Insert Pictures dialog, type gradient design in the Bing Image Search box. 4. Highlight your chosen image and click Insert. 5. If you don’t like the selected image, click the Undo icon, press Ctrl+Z, or click Reset Background at the bottom of the Format Background submenu. This straightforward gradient is simple and elegant, but you could add a few more design elements. 6. 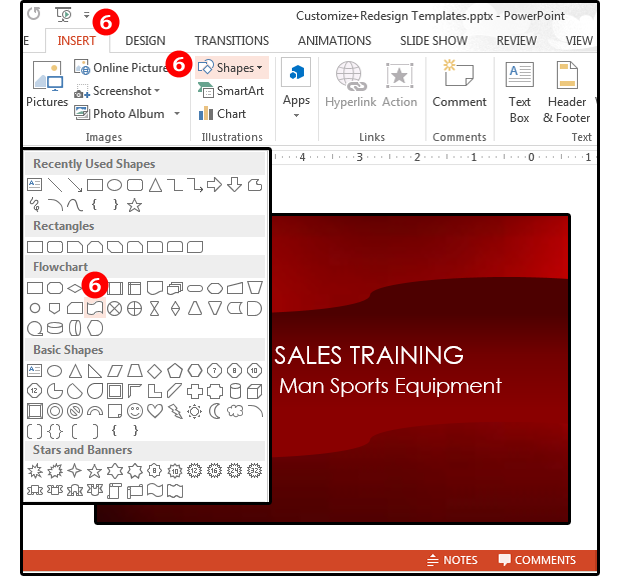 From the Insert tab, click Shapes, then select a shape from the graphic shapes list. 7. Add or draw that shape onto the slide, then click the Drawing/Format tab. 8. 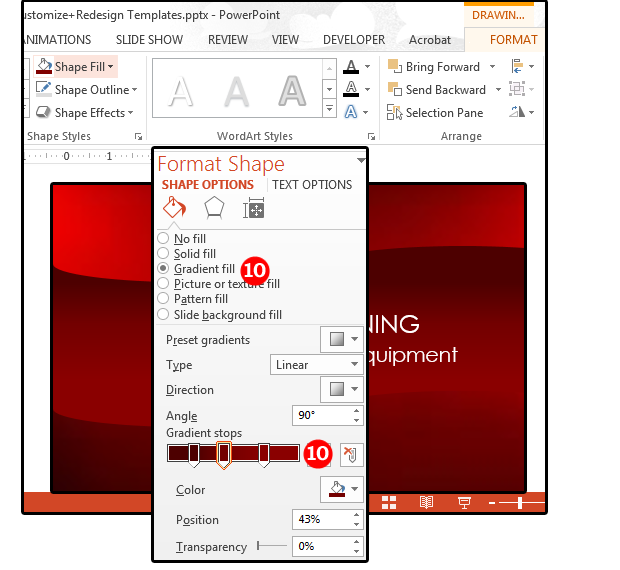 Select a Shape Fill from the Shape Styles group, then click Gradient from the Colors menu. 9. Choose a Gradient from the options menu or select More Options. 10. On the Format Shape submenu, click Gradient Fill, then make adjustments to the gradient on the Gradient Stops bar. For original templates, the sky’s the limit—but keep these guidelines in mind to avoid common design errors. You can use public domain clip art, stock images, original art and/or photography, company logos and designs, or just create slides from the PowerPoint effects. Simple is elegant: Too many design elements create clutter that competes with the slideshow’s message. 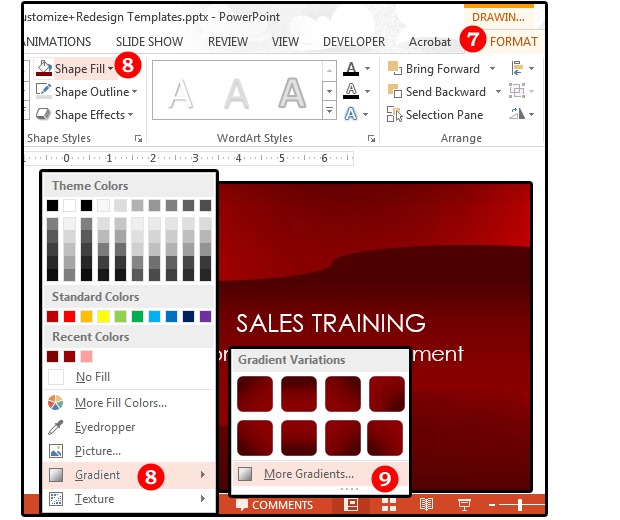 If your design background is limited, browse thru PowerPoint’s templates online for ideas. Design a theme that matches the topic and your company’s corporate identity, not your personal preferences. Create a color palette for your theme. Your company’s brand colors are good place to start. 1. Open a Blank Presentation. PowerPoint's default is a blank white slide with two lines of text: Title and subtitle. Enter both, then select a font: typeface, size, and color. You can use display fonts for titles, subtitles, headers, and subheads, but not when stacked. For example, if you use a display font for the title, use a san serif or milder font for the subtitle. 2. 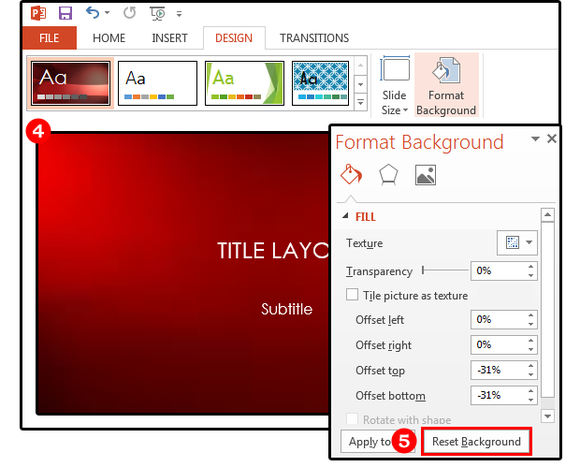 Continue by selecting a background color. In the Customize group under the Design tab, click Format Background. 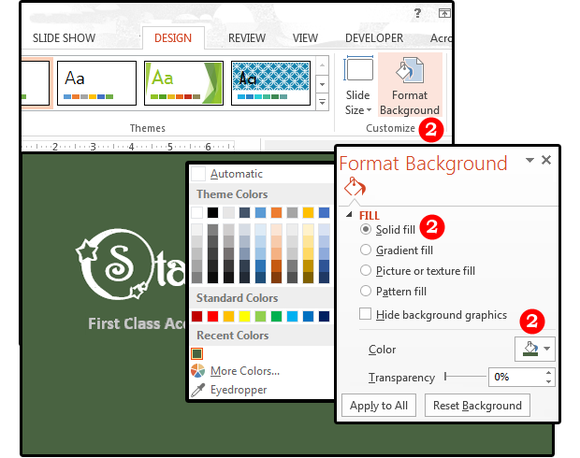 In the Format Background submenu, select Fill, then choose a color from the color palette. 3. So far, nice font, boring background. 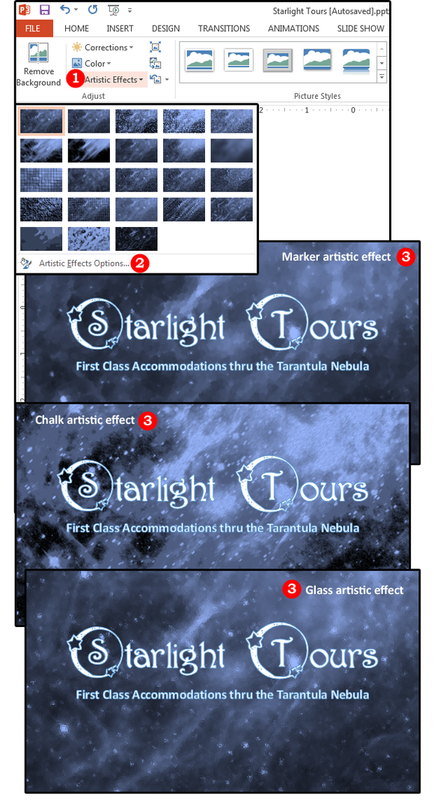 Because the company name is Starlight Tours and the subtitle is First Class Accommodations thru the Tarantula Nebula, a background image of that Nebula would be appropriate, but it might also be too busy. Try the Hubblesite gallery. You can’t resell these photos or print them onto mass produced t-shirts, but single use is okay. Visit the Hubble site and download an image of the Tarantula Nebula. Under the Insert tab, click Pictures, navigate to the Pictures folder, select the nebula you just downloaded, and click Insert. 4. The image inserts at a reduced size. Notice that when it’s selected, the Ribbon menu displays a new tab (Picture) above the Format tab. Select this tab to display the Format/Picture menu. Next, click the handles around the picture and stretch down and over to fill the slide. If the image is disproportionate, oversize it, then use the Crop button to remove the excess. 5. 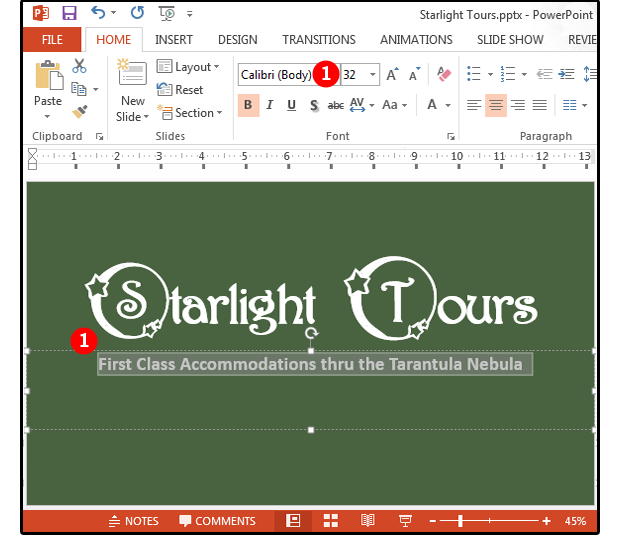 You can also click the up and down arrows in the Size group, or select the tiny menu options arrow in the bottom right corner of this group to display the Format Picture submenu. Use the options on this menu to size the image more precisely. 6. Next, select Send Backward > Send to Back from the Arrange group to move the image behind the text. This starry background is cluttered. Text will get lost in the muddle. But if you must use this image, PowerPoint has several ways to help. 1. First, select the title (then the subtitle). From the Home tab, select Font > Bold, Paragraph > Center. 2. With the text still selected, click the tiny menu options arrow in the bottom right corner of the Drawing group. 3. 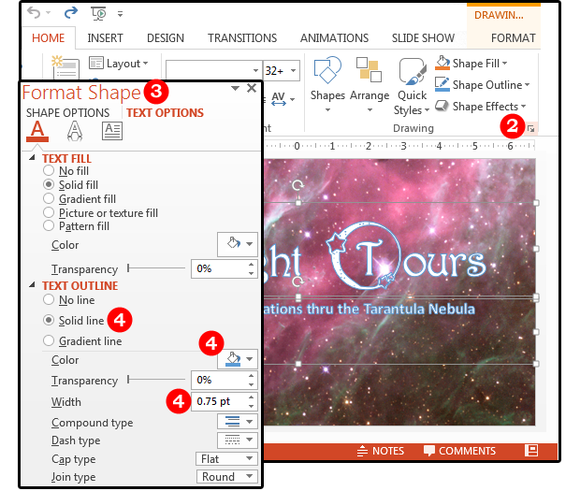 On the Format Shape submenu, select Text Options. 4. Under Text Outline, select Solid line, Color: Blue, Width: 0.75 pt. 5. 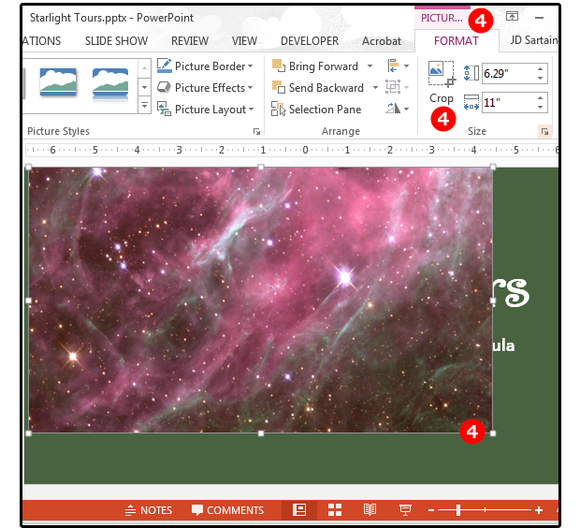 Click the nebula image to access the Format/Picture tab. Select the tiny menu options arrow in the bottom right corner of this group to display the Format Picture submenu. Once displayed, click the picture icon to display the Picture Corrections submenu. 6. Under Picture Corrections, adjust the sharpness, brightness, and contrast as needed. 7. Under Picture Color, set the saturation to 50 percent to fade the image and allow the background color to bleed through. This makes the text stand out more. 8. Re-adjust the size of the image under Crop, then crop again if necessary. 9. 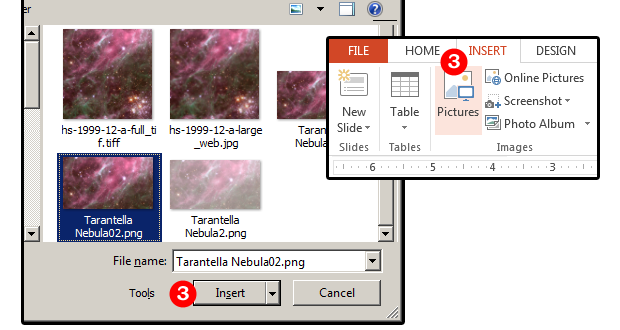 Once again, click the nebula image to access the Format/Picture menu. 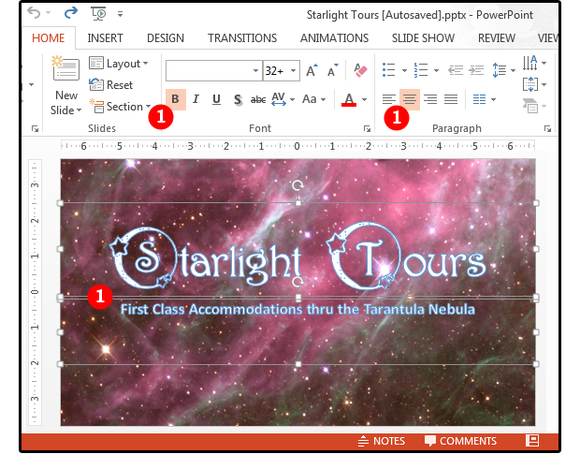 Select the tiny "menu options" arrow in the bottom right corner of this group to display the Format/Picture submenu. 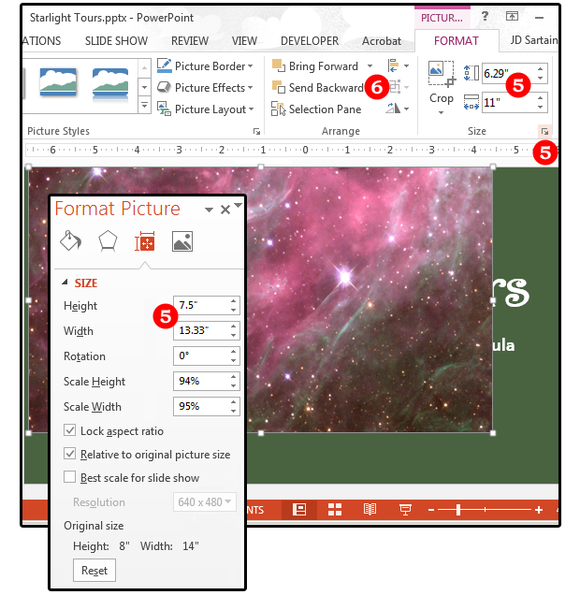 Once displayed, click the Picture icon to display the Picture Corrections/Color/Crop submenu. 10. Under Picture Color, in addition to saturation, you can also change the color tone or recolor the image—not individual objects, but the entire image, like a color screen. Just click the little down arrow in the Recolor box and select a color screen from the list. 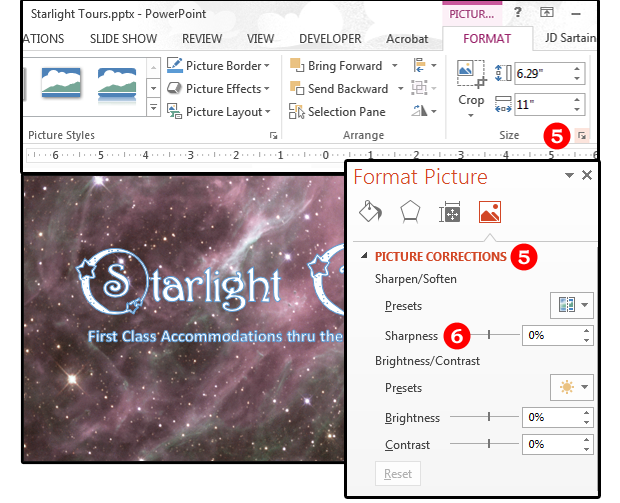 Consider using one of PowerPoint’s artistic effects to alter the image further. It’s not Photoshop, but many of these effects are similar to Photoshop’s artistic effects. 1. 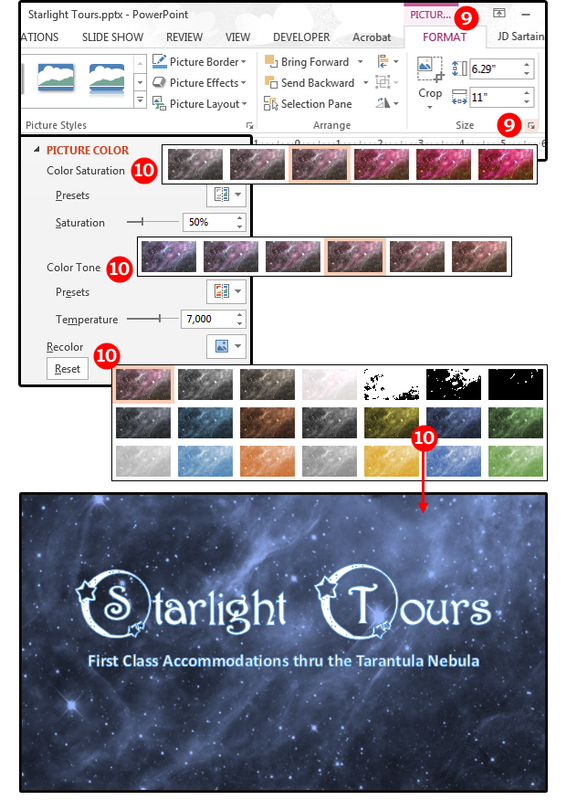 Select the nebula, click the Format tab, then click Artistic Effects in the Adjust group. Go ahead and experiment. It’s fun. 2. Every designer should provide the client (or the boss) with options. The long list of Artistic effects include: Marker, Chalk, Glowing Edges and more. 3. My second, third, and fourth choices were Marker, Chalk, and Glass. 4. After some experimenting, I chose Glowing Edges: not too busy, dark enough for the text to stand out. For the pages with body text, hoever, I needed even less clutter. 5. 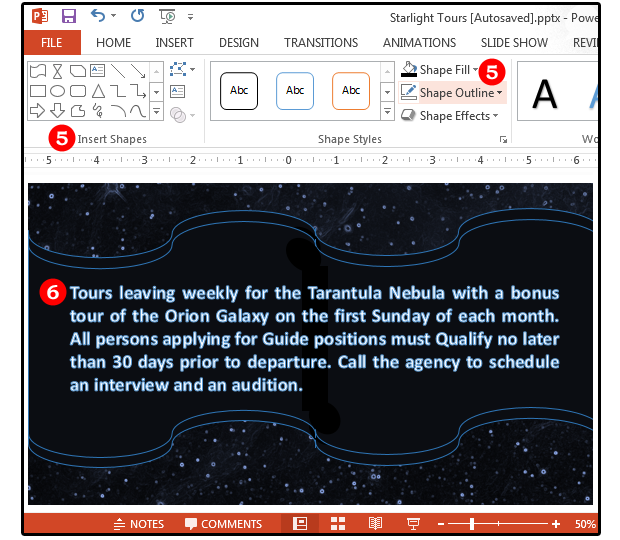 For the body text pages, insert a dark shape across the center of the nebula page and size it about a half-inch smaller than the page on the top and bottom. Select a black fill and a medium blue outline (match the color used on the font). This gives the illusion of a matching border for the remaining pages. 6. Enter the body text for this page, then duplicate this slide for each page in your presentation. It’s easier and faster to type over body text (with defined styles), than start with a new text box.